We live in a world that is enamored with “ME.” This should not surprise us. We are most familiar with ourselves, and our fallen nature most readily seeks to magnify ourselves (to the exclusion of God and others) much of the time. We see evidence of this on the athletic field where star athletes boast of their personal accomplishments, even in team sports like football where all 11 positions exhibit an essential role on every play. We see evidence of this in the political arena, where elected officials (or those seeking office) talk about their personal accomplishments, forgetting that our government is designed to run through a series of checks and balances where different branches (and hundreds of individuals) partner together for the common good. We see evidence of this in our own lives as we think about our personal preferences (in a variety of areas) instead of what is best for others — even those who are not like us. Football players who think it is all about them, demonstrate a lack of understanding of the game. Politicians who try to go it alone show a lack of constitutional intent. Individuals who think only of themselves fail to see the realities of society. Into our individualistic world, Jesus comes . . . and when He comes, He turns this world’s ME culture upside down. In fact, when Jesus talks about glory, He focuses that on God alone. And when He talks about people, He often flips the “M” in “me” around to make it a “W.” “We” is a word that all Christians need to be familiar with. God never intended for us to live our spiritual lives alone. He always intended us to be a “we” not a “me.” That is why it “was not good for man to be alone” in the Garden of Eden, and that is why Jesus saves us into His Body, not as independent operators. We are designed by God to be a part of a team for all eternity. We are designed to be included with others and to include others with us. 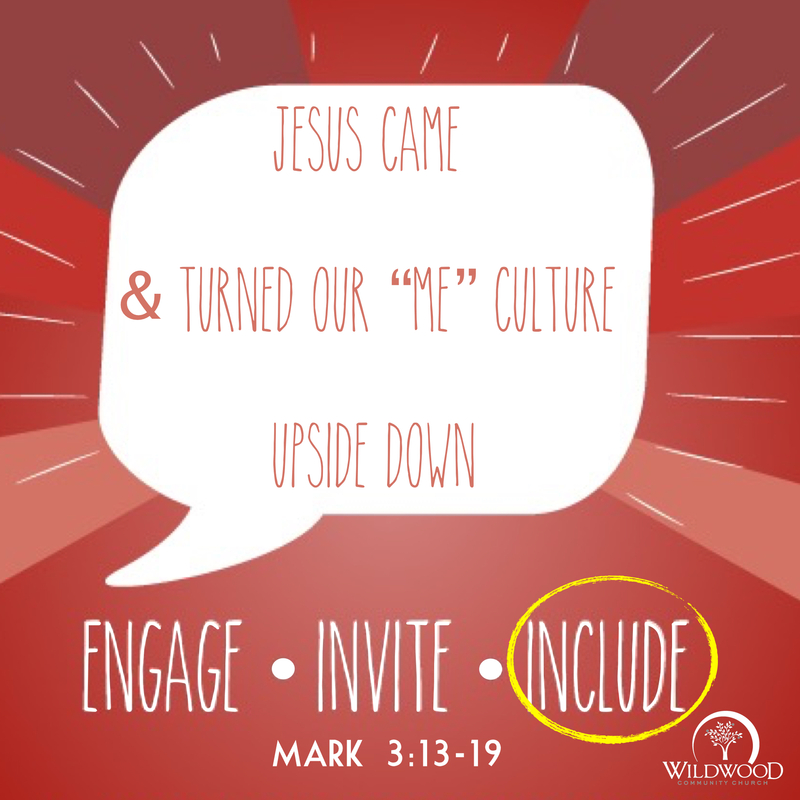 We are going to be talking more about this idea this Sunday, January 31 at Wildwood Community Church in our 8:15, 9:30, and 11:00 worship services as we wrap up our “Share” series by looking at Mark 3:13-19 together. Hope to see you all in one of our services this weekend. Engage those around you, and invite them to join you at Wildwood this weekend as we see how we are all included in God’s strategic plan to change the world.